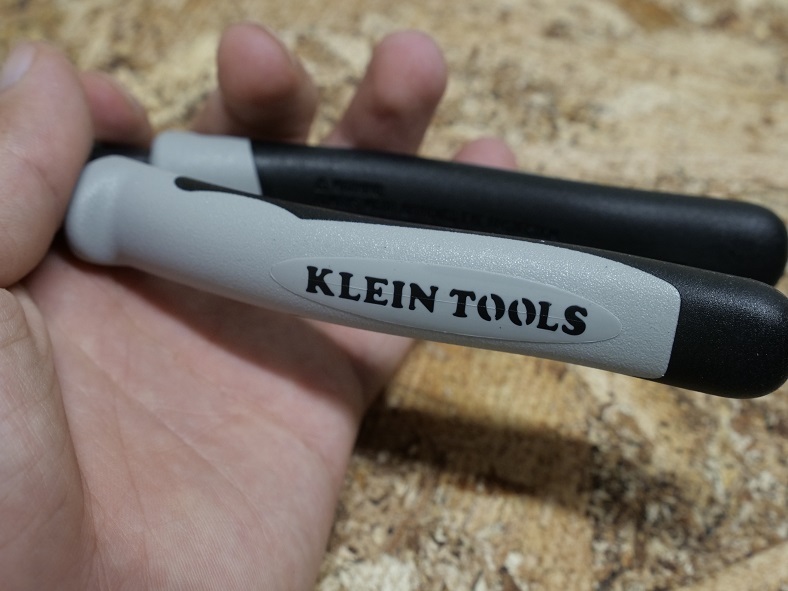 Klein Tools released their new Hybrid Pliers with Crimper J215-8CR back in May/June 2018 and this is a hand tool that combines the functionality of linesman pliers and wire strippers and merges them into one tool. In this article I get to test them out and review them. 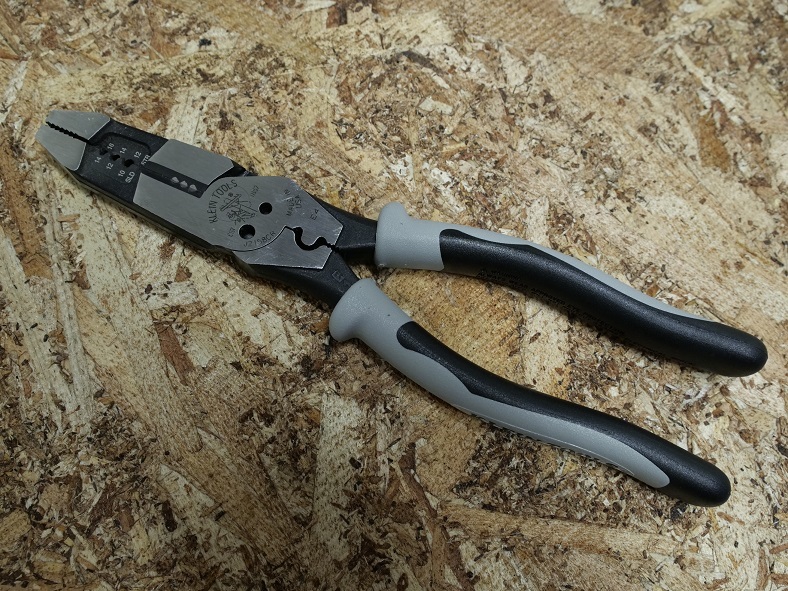 Klein Tools was kind enough to provide the Hybrid Pliers with Crimper J215-8CR at no cost for review. However as with all my reviews, I am not paid, sponsored, or obligated to give a positive review. This review is my opinion of the product based on my usage and knowledge and my review will reflect what I like and dislike about the product. I will do my best to provide you with an unbiased review. Lots of wire strippers already have many built in functions and features that keep it being one tool rather than two or more however in most cases you’d still need additional linesman pliers for doing things like twisting wires. 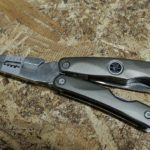 Klein released heavy duty wire cutters which I also reviewed last year and this wasn’t the first time they would combine two separate tools into one as they’ve now created their Klein Tools Hybrid Pliers with Crimper J215-8CR. 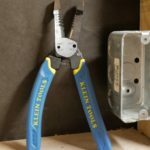 The Klein hybrid pliers takes many of the same features from the heavy duty wire strippers but beefs up the entire thing and replaces the handles with longer handles. 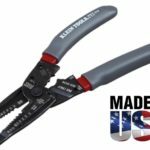 In many ways, the Klein heavy duty wire strippers and the new hybrid pliers are very similar however while the heavy duty wire strippers were wire strippers first with some functionality of a linesman plier, these new hybrid pliers are linesman pliers first with the added functionality of a wire stripper. The head itself is large and the knurled texture is very grippy and makes twisting wire a breeze. 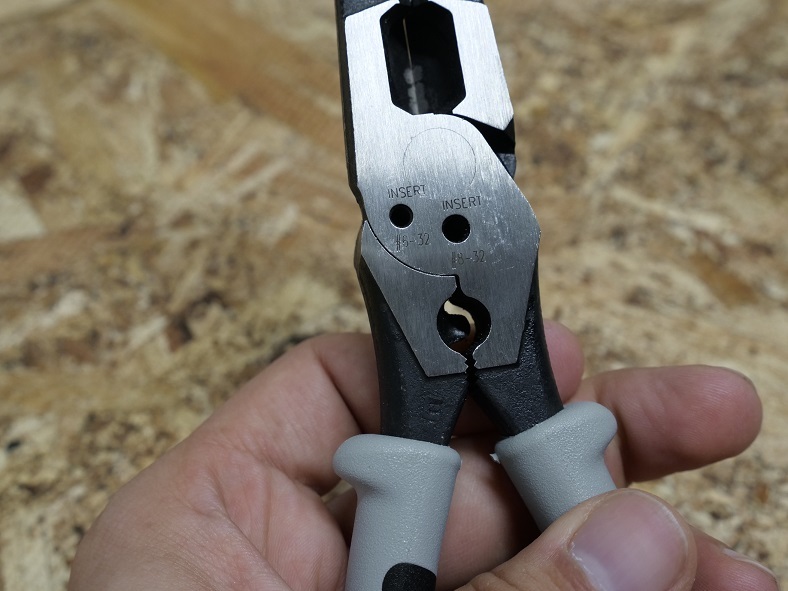 I liked that the knurled texture is very fine and while it offers very good grip, it doesn’t damage wire sleeves as much as other pliers. Just below the knurled head are built in wire strippers. They don’t offer as much wire stripping variety as a regular pair of wire strippers since you only get the ability to strip 3 different size wire in 14, 12, and 10 gauge solid or 16, 14, and 12 gauge stranded wire. I’m not an electrician by trade so I can’t say how the missing smaller and larger gauges would affect an electrician but for me, these hybrid pliers wire stripping sizes are sufficient for my needs as I only work with 14 and 12 gauge solid and some 14 gauge stranded around the house doing minor electrical work. 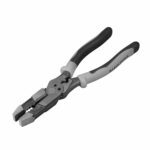 Just like a traditional pair of pliers and wire strippers, these hybrid pliers come standard with a built in wire cutter. While they don’t cut like traditional wire strippers which work similarly to a pair of scissors, these cut more like a regular pair of pliers which work more like a bolt cutter. Personally I prefer the shearing style of regular wire strippers as they are very easy to use however these bolt cutter like cutters on these pliers work very well in my experience and this is due to the added leverage from the longer handles and makes cutting even 12/3 Romex very easy one handed. Below the wire cutters, you’ll find a pair of holes to shear the ends of 6-32 and 8-32 bolts and just below those is a wire crimper. I wasn’t able to test out the crimper since I don’t have anything to crimp and the same goes with the bolt shears, however I have no doubt that these should be able to do the job just fine. Then to the bottom of the tool, we find the handles which were comfortable to use in my experience. 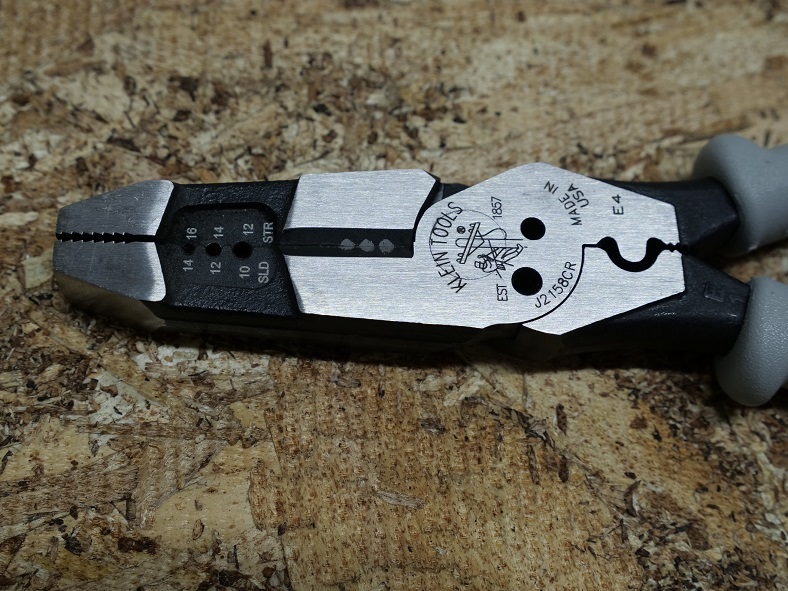 The quality and fit and finish is excellent on these pliers as the machining is done nicely and both sides line up nicely when the pliers are closed. The opening and closing action is smooth and precise and again, the handles are comfortable to use even when under high leverage gripping and cutting. Overall I found these pliers to be very good, they did all the jobs I could test for very well and the handles are comfy. The only thing that they are missing and would make them excellent instead of just very good would be if they added a spring and lock to the handles. This would in my opinion be a very big upgrade in terms of ease of use as I usually shy away from any type of wire strippers that don’t offer this feature as it feels like I’m operating chopsticks if they don’t feature a spring to automatically keep them open. Either way, these are still a very good set for most of my uses. And because of their double functionality, it means I can take less tools to my next job around the house instead of a separate pair of wire strippers and a separate pair of linesmans.